Many people don't realize there are many Dakotas and a few Lakotas living in Canada. There are 8 Sioux Reserves (in Canada they are called Reserves rather than Reservations) in Canada, 4 in Saskatchewan and 4 in Manitoba. 7 of the 8 reserves are populated by descendants of the Dakota Tribes - Mdewakanton, Wahpekute, Sisseton, and Wahpeton (plus a few Yanktonai). The 8th reserve is populated by descendants of Sitting Bull's band of Hunkpapa Sioux. All Sioux in Canada are descendants of refugees escaping from the 1862 war or are descendants of refugees from Sitting Bull's band. 1. Round Plain - This Reserve is near Prince Albert. This Reserve is populated by all 4 Tribes of Dakota Sioux, but predominantly Sisseton. 2. White Cap (formerly Moose Woods) - This Reserve is near Dundurn. This Reserve is predominantly populated by Sisseton. 3. Standing Buffalo - Near Fort Qu'Appelle. Like the previous Reserve, it is also predominantly Sisseton, but there are some Wahpekute as well. 4. Wood Mountain - Near the town of Wood Mountain. The majority of Sioux on this Reserve are descendants of Sitting Bull's band of Hunkpapa Sioux. 1. Birdtail - Near the town of Birtle. The majority of Sioux on this Reserve are Mdewakantons, but there are also a few Yanktonai. 3. Oak Lake - Near Pipestone. I'm not sure of the makeup of this Reserve, but there are some Yanktonai. This one and the Birdtail Reserve are the only Reserves populated by Yanktonai. 4. Long Plain - Near the town of Portage La Prairie. This Reserve is not solely Sioux, but there is a large Sioux segment on this Reserve. I'm not sure of the makeup, but I think they are mostly Sisseton and Wahpeton. Although the War of 1812 is often forgotten, regarded as a stalemate, or misunderstood as an American victory, it played a prominent role in the shaping of the Canadian identity as well as helping to establish a permanent border between Canada and the U.S. Throughout the conflict the Dakota Nation played a pivotal role, both as a military force and in the establishment of lasting relationships with the Canadians. Many factors are cited as causes of the war: trade restrictions on American goods, the impressment of Americans into the British Navy, or the history of general malcontent between the two nations. Perhaps the most significant factor for First Nations participation was the support against American expansion that the British were giving to these indigenous peoples. 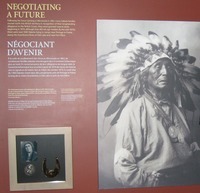 The expansion of American settlement had ushered in an era of harsh and often brutal takeovers of First Nations lands. Clearly, the Dakota had at least as much at stake in the rising conflict with the Americans as the British. Described by a Virginia Republican as a “land grab,” the war began in June of 1812. With the British also engaged in a long and costly conflict with Napoleon at this time, the Americans found this to be an opportune moment to strike. What the Americans thought would last only six weeks continued for two and a half years. Bloody battles and destructive invasions were fought on the Atlantic coast and on the frontier, along the Great Lakes and the Saint Lawrence River. First Nations involvement in this conflict was key, and the importance of the Dakota is reflected in the many alliances that were made with the British. However, the history of formal political alliances between the Dakota Nation and the British started long before. In the summer of 1764, the Dakota, along with the Sauk and Fox, Ojibway, Shawnee and Menominee formulated an alliance with the British at Fort Niagra. As part of this alliance, the Dakota fought alongside the British during the American Revolution under the leadership of Wabasha. While important political alliances were instrumental in building the relationship between the Dakota and the British, more intimate relationships were also formed with fur traders and the like, thereby cementing these alliances in new and interesting ways. Wahpeton leader Red Thunder’s sister, Totowin, married fur trader Robert Dickson, making Dickson a part of the vast social networks of the Dakota communities. Additionally, Dickson’s trading partners also married into the Dakota kin network, and these men became relatives of prominent Dakota leaders such as Little Crow (Chetanwakoamane) and Wabasha. Dickson and his new Dakota relatives played a key role in many battles of the War of 1812. Thanks to these marriage alliances, by the time the War of 1812 began both French and British had relationships with the Dakota of the Mississippi and Minnesota rivers. The role of Dakota women in forging these marriage alliances is an interesting topic that necessitates further exploration. Certainly, these women were not just passive bystanders of either the alliances themselves, or the conflicts in which their families were involved - there is evidence of the women’s participation in battle. For the Dakota, choosing to fight for the British was not simply driven by political alliances with the monarch; it was also necessary for the protection of extended family in the Dakota communities. Some of the most successful battles were fought and won with the aid of the Dakota at forts near the Mississippi and Wisconsin Rivers, and this territory was held until the end of the war. While Robert Dickson is given most of the credit for engaging and leading the First Nations west and south of Lake Huron, he could not have achieved success without the support of the Dakota leaders themselves. Dickson certainly facilitated communication between the Dakota and British forces, resulting in victories at Fort Michilimackinac and Fort Detroit. 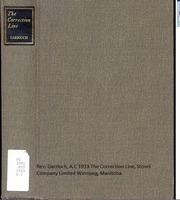 In the end, Dickson’s ties to his First Nations relatives outlasted his ties to the British. In his efforts to feed hungry First Nations women and children with Army supplies, he was accused of attempting to usurp the authority of the British military. In spite of the promises made and gifts presented to the Dakota and other First Nations on behalf the British, when it came time to negotiate peace, First Nations were ignored. The Treaty of Ghent was signed in modern day Belgium in 1814, far from the First Nations representatives who had played such a significant part in the conflict itself. Whereas the British recognized this contribution through the later distribution of gifts at the 1816 gathering at Drummond Island, they failed to fulfill their promise to protect the traditional homelands of the Dakota and other First Nations groups. Indigenous leaders like Wabasha, Little Crow, and Red Thunder had sought the establishment of an independent First Nations homeland, and alliances with the British were formed with this in mind. Acting on behalf of their autonomous nations, these First Nations leaders were seeking to protect their own social, political and cultural structures as much as they looked to aid their British allies. 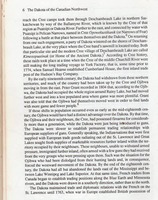 The history of the role of First Nations, more broadly, and the Dakota specifically, in the War of 1812 is just as much about building what would later become the nation of Canada as it is about the solidifying of Canadian identity—and the contribution of the Dakota Nations remains a significant part of this story. Just thought id share an update. The Dakota demonstrated the value and trust they placed in the promises of the British with their arrival across “the medicine line”, following the “Dakota Uprising” in Minnesota. Arriving near Fort Gary in 1862, their leaders announced that they had come in accordance with their alliance to the British, quoting promises made to them during the War of 1812. They brought their medals and flags that they had received from the British during this conflict. Many of these medals survive to this day, as do the stories of the alliance between the Dakota and the British. They remain central to understanding the history of the Dakota people who live in Canada today. As I am recent newmember, have not had the chance to read such interesting historic news from Dakota nation in Canada it widens our poor knowledge of Dakota .Most of what we know is from the US side. Many thanks to Jimmy, RedLightening and Grahamew for all this. Will try to get a copy of the book. The Dakota/Sioux in Canada, whose traditional governance structure was also part of the Seven Council Fires or Oceti Sakowin, and whose traditional lands extended into both Canada and the United States, have a long standing relationship with the British Crown, dating back to wampum ceremonies in 1762. Ancestors of the Dakota First Nations had a long-standing alliance to the British Crown, which was affirmed through many promises and agreements, including a signed treaty in 1787. The Dakota upheld their promises of alliance by assisting the British in the Pontiac Wars, The American Revolution, and the War of 1812. The Dakota have a long standing history of bridging relationships in aid of their allies. Awareness and knowledge are meant to recognize the Dakota-Crown alliance, which extends back to the seventeenth century, and the contribution of the Dakota to Canadian history. 5 Dakota Reservations in Manitoba, Canada. Further to Archaeology Research-Sandy Lake Ware Pottery. In 1680, Father Louis Hennepin was captured by the M’dewakontonwan Dakota where he was serving as spiritual guide on a voyage of discovery down the Mississippi River. He was taken by the Dakota to their village near the mouth of the Rum River on Mille Lacs Lakes in present-day Minnesota. His description of the Dakota clearly identifies who his captors were, the location of their village, and the nature of their non-European technology. In 1972, G.A. Lothson, then a graduate student at the University of Minnesota, excavated the Rum River site. The most distinctive feature of the site is its ceramics, which are also mentioned by Hennepin. Lothson concluded that this pottery, named Sandy Lake ware by archaeologists, was manufacture of the Isantee Dakota and that the area over which the pottery is to be found identifies at least a part of the territory occupied by the Dakota at the time when that Ware had been made. 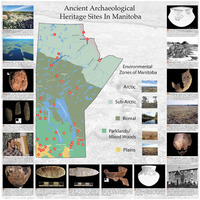 Subsequent research has identified thirty-four sites containing Sandy Lake Ware in Wisconsin, Minnesota, western Ontario and eastern Manitoba. The few dates that have been obtained for these site span the years from 1150 A.D. until slightly after the time of contact with Europeans, when aboriginal technology, notably pottery, was displaced by trade goods. 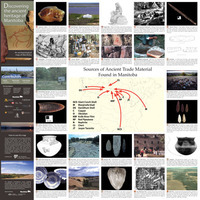 As might be expected, there are archaeological sites that contain both Sandy Lake Ware and trade goods of European manufacture. The earliest travellers in the western regions of the Great Lakes placed the Dakota in the territory that Sandy Lake Ware was found. Maps dating from 1650 to 1750-including a map prepared by Cree Indians in 1728-described the Dakota as occupying the area from Heron Bay on Lake Superior in the east, to the west of Lake Winnipeg and the Red River and south to the Minnesota River, taking in all of the lands west of the St. Croix River, a tributary of the Mississippi, and east of Rainy Lake. The Dakota of the Canadian Northwest. Unfortunately, it doesn't seem to be downloadable.